The Department of Health and Human Services’ most recent enrollment report shows that 18,764 children (ages 0-18) have been signed up for dental coverage in stand-alone dental plans through the new health insurance marketplaces as of February 1, 2014. That’s about 10 percent of the children (age 0-17) whose families have signed up for a health plan. What we don’t know, however, is how many of these children are signed up for “embedded plans” -- health plans that include pediatric dental coverage -- and what that coverage really looks like. Families purchasing an embedded plan may also be left in the dark about what their coverage includes and how their children’s dental benefits are treated when part of a health plan. 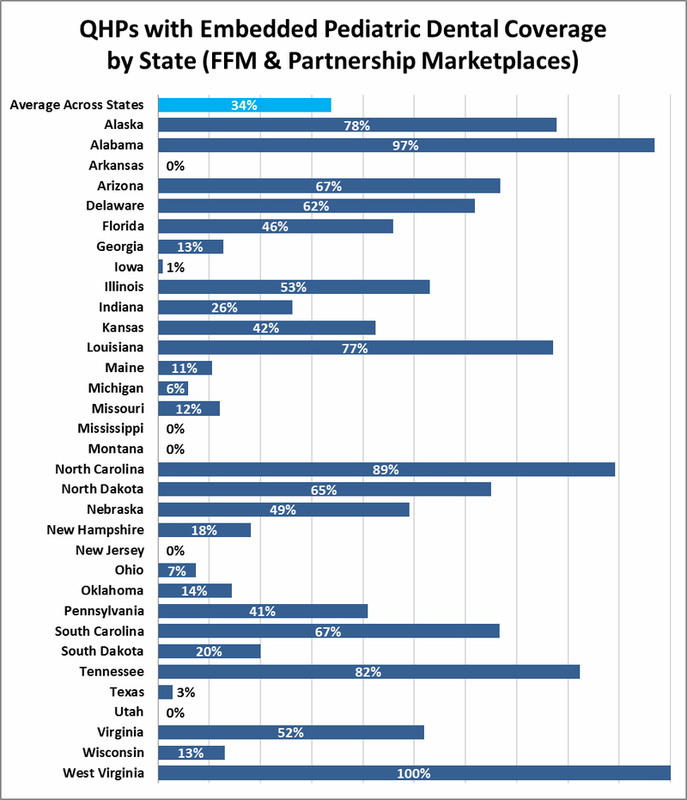 According to federal data, about 34 percent of qualified health plans (QHPs) embed pediatric dental coverage across the 34 states with partnership or federally-facilitated marketplaces. * However, the prevalence of embedded plans varies considerably from state to state. For example, nearly all QHPs in Alabama and West Virginia embed pediatric dental coverage (97 and 100 percent respectively) while less than 10 percent of QHPs include pediatric dental coverage in Michigan and Ohio (see chart below). By comparison, every one of these marketplaces has stand-alone pediatric dental plans available for purchase. In areas where both plan types are available, families may struggle to compare dental benefits between QHPs and stand-alone dental plans. When browsing health plans on HealthCare.gov, it isn’t always clear to consumers which health plans include pediatric dental coverage. And while the standard summary of benefits is almost always a click away, it simply indicates whether a dental checkup is covered. Consumers can take this as an indication that the plan covers the same services as stand-alone dental plans in the state, but additional information isn’t always provided in plan documents. As our FAQ points out, in order to make an informed decision about their children’s dental coverage options, families need to understand how cost-sharing and deductibles will apply to pediatric dental benefits regardless of plan type. Families of children with high dental need who are otherwise healthy may not want to purchase a health plan that subjects pediatric dental benefits to a high medical deductible. Rather, they may opt for a stand-alone dental plan with a lower dental deductible or choose a QHP that exempts pediatric dental services from the deductible altogether, as most plans in Connecticut do. Dental benefits are just as important as any other aspect of the essential health benefits for children and families should be able to make well-informed decisions. This means that health and dental plans alike must provide the information needed for consumers to make an apples-to-apples comparison of pediatric dental coverage options. While the standard summary of benefits developed at the federal level does not provide this level of detail, insurers in all marketplaces should be required to make this information easily accessible during the shopping experience. This is something that state-run marketplaces currently have the flexibility to require. In addition, the effectiveness of consumer assistance personnel like navigators and in-person assisters depends on the ability to review the details of plan options. In addition, the effectiveness of consumer assistance personnel like navigators and in-person assisters depends on the ability to review the details of plan options. *Excluding states that have no QHPs embedding pediatric dental, that increases slightly to 37 percent.